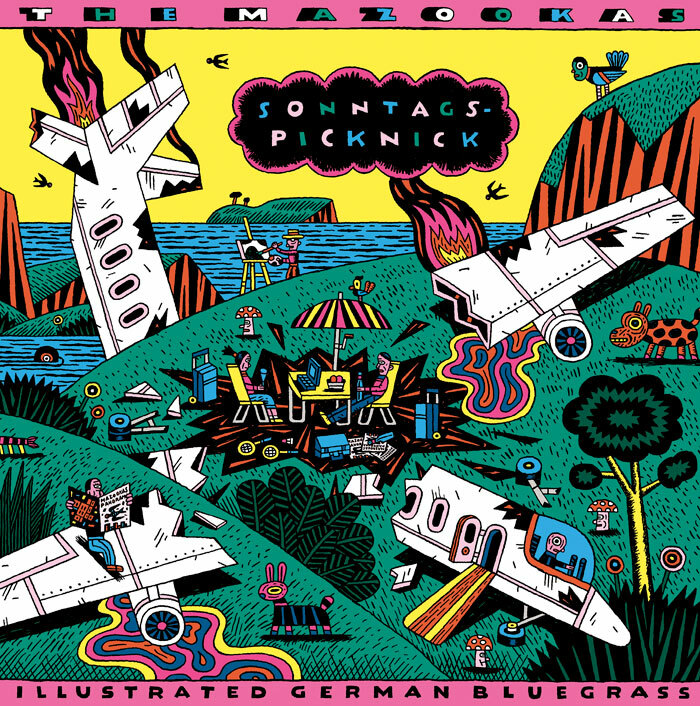 The Mazookas are a group of illustrators and graphic designers from Berlin who present their graphic art by playing popular folk music from Eastern Europe to West America. The Mazookas took their name from a quote by the New Orleans jazz pianist Jelly Roll Morton, who pronounced the traditional Polish folk dance »Mazurka« as »Mazooka«. This slang is a good illustration of how art forms such as music migrate and are adapted and reproduced in other ways, which led the band to call themselves The Mazookas. The group takes their musical inspiration from libraries of early folk music, such as the Library of Congress Recordings and the Smithsonian Institute collection. Just as the band members admire the genius of certain untaught visual artists, The Mazookas themselves approach music as untaught musicians. Their shows feature ambitious amateur music skills, unusual instruments, humour, irony and a colourful and entertaining visual set.